The first day of November, I did something I hadn’t done in a very long time. I decided I was going to an open call. It would be my first open call in New York and I wanted to make it count. So I planned an outfit that would make me look 60s chic without going overboard, and I skimmed through my appropriate sheet music, finding that I actually didn’t possess the right songs for the show being cast. I instantly reprimanded myself and was about to can the entire idea when I thought to myself, ‘You made a decision. You can’t back down now.’ So I decided I’d go to the audition with whatever was in my songbook and if I were lucky enough to be called back, then I would do the extra prep work then. The fact that I’d built up the resolve to go to a cattle call was good enough. The next day, to take away the stress of not feeling fully prepared for the audition, I linked up with a friend from London who’d happened to be in town on his honeymoon. He and his partner chose an unfortunate time to be in New York, however, as Hurricane Sandy blustered her way through town not too long after their arrival, leaving the newlyweds without power below 14th Street. Being resourceful, however, he’d managed to find alternative living quarters. He also managed to get me from the Upper West Side to Hell’s Kitchen to say hey and to meet other artists. It was a visit I welcomed wholeheartedly because I was in desperate need of London energy. I hadn’t been able to make many new friends in the city who weren’t co-workers, and the friends I did have in the city were so scattered about the place that linking up with them was becoming a more difficult task. I wasn’t feeling loved in the city. I’d begun to prefer the London Fog to what I’d started calling “The Rotten Apple.” I knew I shouldn’t have allowed my emotional success to reside in such a specific location, as I definitely had hardships there as well…but forcing a connection with a place wasn’t healthy either. It felt akin to trying to make a relationship work because one felt he must; not because the foundation was strong enough for it to work on its own. Upon linking with my friend -a former co-star in a brilliant new musical I’d had the chance to workshop multiple times while living in London- I was able to relax and talk shop for a bit. We’d both been informed that the show we work-shopped had been picked up to be performed by one of the most reputable companies in the world. We were both on pins and needles hoping that we’d get a call or news about when the show would premiere, and if we’d both still be a part of it. Conversation waned once the hype about art was over, but it was an important enough conversation to plant a seed of hope in me for my future. In the back of my mind, I was confident that, regardless of whether I lived in New York, London, or the Amazon, I was going to be a part of that new show if it killed me. I believe that second day of November was the day I remembered what ambition felt like. But how long would that memory remain? The next day, I woke up, threw on a decent outfit, gathered some sheet music from my song book and packed a headshot and resume, and then trekked into midtown at 6:30am to attend the open audition for Motown the Musical. Having known someone who was a part of the workshop, I was confused as to why the show was still auditioning when they seemed to be fully cast. Still, I figured it wouldn’t hurt to be seen. About thirty-five other early bird artists and amateurs felt the same way, I discovered, when I entered the lobby of Telsey and Company. They were cold, and shivering, and ready to show the world that they belonged on a stage, anyone’s stage. And here I was…feeling…like I’d gone back to high school. Instead of feeling like I was at an audition, I felt like I was at a forensics competition with all the assorted characters. There was even the overachieving, know-it-all girl who made a list of all the people who came in so no one could jump the line. “There’s an order here, and we want to keep it that way.” She smiled one of those psychotic smiles that warned me not to cut in line, or I’d be cut. Then she gave me the sheet of paper that was already covered in scrawls. “Number yourself and sign your name here.” I complied, mainly because it was 6:50am and I am a firm believer that all drama should be put off until noon. What she failed to do, however, was read the fine print on the website –and the door– that said “unauthorized audition lists would not be taken into consideration at all unless distributed by Equity.” So after the doors were officially opened into the audition room (and after about 200 more people showed up), I moved from being the thirty fifth person to number eleven (merely because I was closest to the door). In waiting for the auditions to begin, I watched a good twenty people change into their best thrift store costumes to emerge as people from my grandparents generation. I enjoyed their efforts, and their outlandish afro wigs. Power to the people! I watched American Idol wannabees riffing up, down and around the scales as they warmed their voices. Girls plastered on too much make up. Guys got in touch with their falsetto. Yet, I was still wondering if singing Stevie Wonder’s “Don’t You Worry ‘Bout a Thing” would motivate me to do exactly that. I wasn’t worried, but I was overwhelmed at the environment. I’d luckily avoided open calls my entire London career because of my wonderful agent there. It felt strange knowing that I’d only have 16 bars of a song to represent all of what I could possibly do. But when they called my name, I knew I’d have to try. It was a very brief audition. I wasn’t asked to remain, like some others were…and I was ok with it. Unlike others, I wasn’t there to compete or make fun of others or challenge anyone. I was there to challenge myself. The hard part was done; going to the damn audition. I was proud of myself for taking that risk. I laughed off the entire day and prepped myself for a return to work and normal non-actor routine. My wake up ritual had become the same. My iPhone would play a snippet of the pop song I’d programmed to wake me up at my designated time, and I’d listen to see if one of the 4 other roommates were plodding across the floorboards. If so, I’d wait until I heard a door shut, and I’d start my day of avoiding people until I had to step outside of my building. Considering we still did not have a bathroom to call our own, I’d sometimes had to go to the coffee shop next door to pee. The election was around the corner. In my mind President Obama was just bound to win. I had no doubts. But I was also disappointed in myself for not getting my absentee ballot mailed off much sooner that the day before elections. It was evident that my vote wouldn’t count, but I did try. Unfortunately just as I’d missed my chance to vote on time, I’d also missed the moment when the POTUS actually won his second term. Walking through Harlem at 10:58pm (I’d stayed at work late and went to the gym) and hearing the cheers and the overall relief at the victory was enough to warm me up on the suddenly chilly Election evening. If anything was certain in my life, it was that our President would be spending the next four years doing his best to make a difference. That was about all I could count on. The next week, I was supposed to be celebrating my debut on ABC’s Revolution! I’d made the mistake of telling friends and family that I would most certainly be a part of the episode that was airing only to receive an e-mail from my agent stating “your part was cut from tonight’s episode.” I wasn’t completely crushed. I’d gotten paid for my work already, so that was proof enough that I actually did the job. “Embarrassed” is a more appropriate word for how I was feeling. People root for me -sometimes- and I wanted those people to be proud that I’d made it to primetime. Truth was: I hadn’t. The only lesson I learned, at that moment, was a professional one. Keep all successes quiet until they occur. I made a vow to myself from then on that if I did anything regarding film and TV, I wouldn’t speak about it to anyone. If I booked a job, I could be happy about it, but only to myself. To tell anyone else would be getting their hopes up and I didn’t want to do that to anyone. I’d experienced enough empty promises in my life to shatter the dreams or expectations of others. Funny enough, I was also beginning to get bored with the empty promises I was making to myself. Two months prior, Rihanna released a song that, though lyrically cheesy, changed my perspective on things. “Diamonds” was a song that told you to shine bright. While others paid attention to the childlike tonality of Riri’s singing voice, I was hearing a command. The message in that line burst through like sun rays through interrupted sleep. “Shine bright like a diamond.” Be not afraid to illuminate this world in whatever way you can. The song itself wasn’t about individuals, but I took the message of “shining” as my personal responsibility. And I told Mo one day, “We must hold each other accountable. Please don’t allow me to let my light dim. And I will do the same for you.” It felt like I was in a twelve-step program…but I knew I couldn’t shine alone. No truly successful person ever shines alone. I would need loads of help from willing participants and people I could trust. In mid-November, Mo became a woman I could trust with my light. As diamonds, we promised each other not to dull. It was hard to feel like I was shining at all when I would go back to my box of a room and have to sleep on a borrowed air mattress with borrowed sheets. Besides my clothes, I felt I was still borrowing my room though I was paying rent. I had no furniture. Most of my stuff was still in a suitcase, and I couldn’t shift or adjust myself on the mattress without sounding like I was farting out the tea, and Entemann’s cake that was becoming my nightly best friend. I wasn’t owning anything, not even my life. My life wasn’t being lived in the way I’d wished. Tough times wouldn’t last, I knew. But God knows I didn’t feel like waiting until the struggle was over for it to be beautiful. I wasn’t feeling beautiful. I was feeling stunted. Luckily art would save the saved the day for a day. After filming a small role for a “Finding Me,” a thriving webseries based on two popular independent films of the same name, I’d planned a trip back home to Virginia for Thansgiving which was that same week. 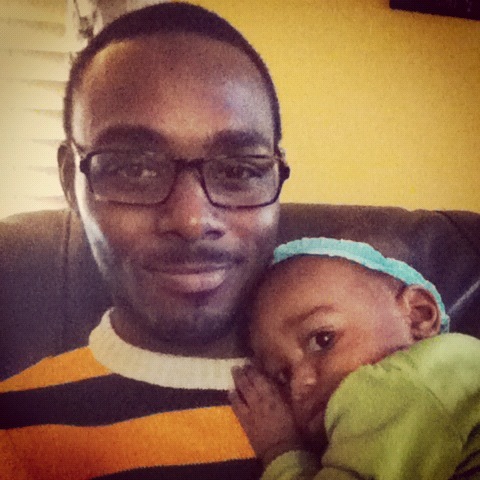 My niece would also be turning one year old that week and I refused to miss her special day. Since her birthday was the day after turkey day, I’d also be killing three birds with one stone: food, family, celebration. Despite a terrbible Chinatown bus journey home, I arrived back in Virginia, hoping that in the time I’d been away that things would have changed. I hoped my sister would’ve become more responsible, that my mother’s worrying about things she had no control over would subside, that my little brother was flourishing in school, and that my niece would still remember my face. And after spending months without me, she walked right over to me so I could pick her up. I almost cried from happiness. Sometimes joy really is in the eyes of a child. My niece looked at me with so much curiosity and no judgment, and then rested her head on my chest. Only a child’s love can be that unconditional, or so I’m told. Thanksgiving Day was full of food -that I helped prepare- and family. The next day, my niece’s first birthday was simple and fun, and then it was time for me to return to New York, where the cold has settled in and I’d have some personal changes to make. What was great was that I was able to spend the end of my month seeing two more friends from London who’d come to visit the city. If anything could lift my spirits, it would be ANY Londoner. Deep in my heart, I knew that I would eventually go back to London. I didn’t know how or when it would happen, but seeing my friends solidified that it would definitely happen. Because I believed in that dream so damn much. Somehow I knew that it would be art that would make me return. But until art decided to make its move, it was back to my daily routine: wake up, avoid roommates, pee at the coffee shop next door, get dressed, and serve people all day long until I got off work, went to the gym, came home, drank tea, ate Entemann’s cake, and fell asleep. Then repeat. This entry was posted in The Concrete Chronicles and tagged actor, adventure, auditions, curiousity, Diamonds, family, fear, friends, hard work, journey, life, New York, patience, routine, survival, unexpected.